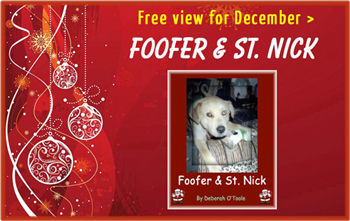 ﻿ News from Deborah O'Toole 12/01/17: Free preview of "Foofer & St. Nick"
Free preview of "Foofer & St. Nick"
In honor of Christmas, a full preview of Foofer & St. Nick is now available. The book can be read online in its entirety from now until December 31st. The four chapters are provided on linked pages, with graphics not available in the Kindle or Nook editions. Click here to read Foofer & St. Nick.